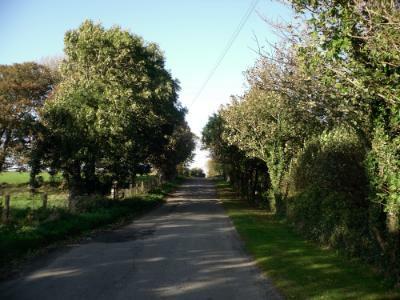 THIS PAGE GUIDES YOU ALONG THE FIRST PART OF THIS ANGLESEY COUNTRYSIDE DRIVE FROM BODEDERN TO LLANFECHELL. 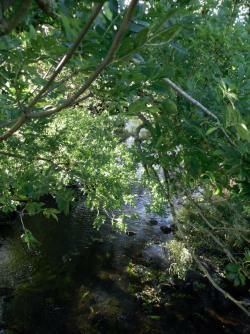 YOU'LL FIND A LINK TO THE SECOND PART OF THE JOURNEY FROM BODEDERN TO RHOSGOCH AT THE BOTTOM OF THIS PAGE. 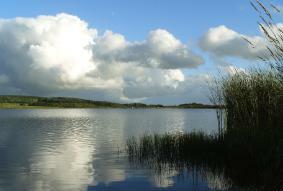 This is a gentle and very pleasant drive to Rhosgoch on Anglesey's back roads. "So what on earth is Wil doing talking about CHAOS THEORY?" I hear you utter. Well, a clue lies in the mechanical object on the left. Stick with me, I'll get you there ... eventually. In the meantime, I suggest that you get hold of Landranger Map 114 for Anglesey and find Bodedern by drawing your finger along the B5109 from Llangefni, through Bodffordd and a few miles beyond. Before we progress out of Bodedern please allow me to share with you why I love this particular journey of about 12 miles. Even though there are a few hills on Anglesey that aspire to be mountains, they're not really. You either find Anglesey to be flat or you find it gentle, rolling countryside. I'm in the second camp. I'd go so far as to suggest that you throw away the map you've just gone out and bought. I'd further suggest that you Get Lost!. Before you cast the map aside take a moment to look the Island. It is surrounded by the sea (by default) and you can only ever travel so far before you strike the coastal road. 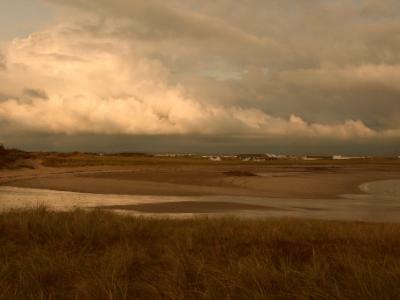 Anglesey is criss-crossed by many, many, many little roads that are voyages of unexpected joyful discoveries. Bodedern is as good a starting point as any. You can't get lost, really. What you can do is engage with pleasant dis-orientation without the use of exotic vegetation or wine gums. Point the car and just get going. However. However, why not indulge me for now and consider the route I propose on this webpage. I believe it'll build up your confidence for getting properly and comfortingly(!) lost. You'll have arrived in Bodedern and encountered the Crown on your right. I'm not sure if they serve meals here, but I do know it's a decent enough place to spend a cold, wintry Sunday evening. Bodedern is a small village with a very busy past because of its central location. I must get a picture of the award winning butcher's shop on your left E.T. Jones Sons & Daughter. It's known locally as 'Lamia' and the late Evie Lamia and his father set up a very successful traditional business that is maintained to very high standards by their offspring. The earlier Mr Jones was a character who could laugh himself into a state of collapse and drag everybody else down with him. Do not turn off this road but follow it out of the village for a few hundred yards to an obvious turning to your right. This road will take you toward Llanddeusant and its water and wind mills. From there to Mynydd Mechell and thence to Llanfechell as the first main part of this route. 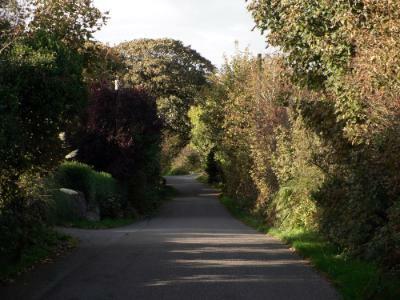 The above photograph is of the road as journeyed along Autumn 2009. Take your time along this road and pause now and then to gaze right and left. Just as you cannot imagine life going on somewhere you've never been, so is Nature going about its business under your nose. There is always something to see. If you're not spotting it then you're just looking hard enough. N.B. This is the working countryside of Anglesey so always give way with a smile and a wave. FOLLOW THIS ROAD KEEPING TO YOUR LEFT. Whatever the season you'll find the journey along this road a relaxing experience. It is worth spending a moment or two just listening to the wind rustling through the reeds and contemplating the faith of a bygone age. The clearing near Ainon Chapel is where open-air baptisms take place even today by the most resolute and religious. It's certainly a memorable experience, I imagine. One to carry with you your life entire as a memory of a committment. Follow this road to reach the merest suggestion of a hamlet called Llanfigael. If you so wish, you could stop to investigate the ancient church and churchard next door to Plas Llanfigael (Llanfigael Hall) on your right up a gentle hill. The churches on Anglesey reach back fourteen centuries at least, though the original wooden stuctures are long gone and the existing churches are relatively new thirteenth century places of worship. If you stop to pay your respects then you will undoubtedly discover that tombstones of the early 19th Century bear rich testimonials to those who could afford it, or were held in high esteem within each small parochial world. You'll know that you've arrived in Llanddeusant, first by the sign and then the crossroads. To make sure, ahead of you on your right is the village hall. This is where the County Eisteddfod was held on occasion. Before the village hall there was marquee in the field where I remember very cold ankles as a child watching my brothers perform on a bare wooden stage. At the crossroads there is a sign to your left for Llynnon Windmill. You should have been able to see the white windmill a mile or so back. It's well worth a visit and it's somewhere I'll write about soon. If you to turn to your right you can find your way to the Melin Hywel Water Mill. You need to keep an eagle eye for the small bridge you pass over. The farm turning to your left will bring you to this pleasant and beautiful musk smelling reminder of past industry. Drive through the lovely village of Llanddeusant and out into the countryside past the church on your left. No shops any more. Either back to Bodedern or on to Llanfechell for an ice-cream. Ahead of you is a half mile straight road to a a chapel, which I believe is called Bethania. This village feels as if it's in the middle of nowhere; however, if you could step into the Tardis and travel back four decades and more to a Sunday evening, then Bethania could well have been packed for a CYMANFA (Concert - come-anva). 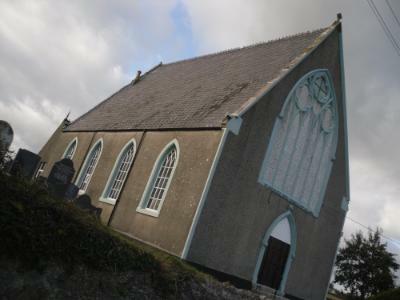 Most of the more remote chapels on Anglesey conducted these Cymanfaoedd regularly and busloads of people would arrive to sing their hearts out, either in praise or because they just loved to sing. AN AGE GONE BY: On such stages my Mum would sing 'Watchman, what of the night?'. Usually sung by a bass voice and tenor; my Mum used her clear Soprano voice in an attempt to counter Cynfarwy's ankle-rattling bass. Apparently, when they sang at Bodedern village hall the lights would flicker in fear of Cynfarwy's boom. Pass Bethania to the left and keep to the left. You'll find yourself in open countryside again with gentle rolling hills, as the two pictures above reveal. Check the Landranger Map and you'll realise that this very open area is dotted with wind turbines. 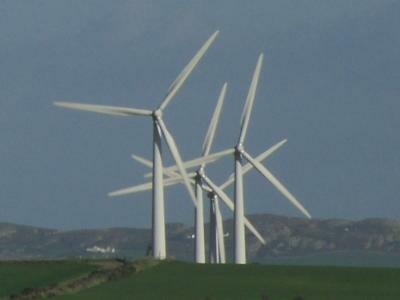 When you arrive here, the wind turbines are pretty blinkin' obvious and seem to gather into gangs as you drive along. The road curves around the hill and down into the shallow valley before rising again into Mynydd Mechell. 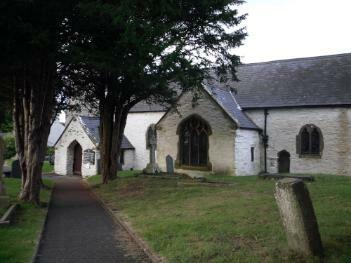 Mechell is the local saint and Llanfechell ahead holds the whitewashed church of St Mechell ('Llan = church). Mynydd Mechell is the extended hamlet leading to the village of Llanfechell. Before I get on to talking about CHAOS THEORY let me share a queer thought about Mynydd Mechell. How do I say this without being insulting to an area I really like? Well, It feels like the 'Appalachians'. Sorry about that. It feels as if it possesses the kind of ... identity of a very isolated community that you'd come across in a Hammer Film. Not the people. Just the place. You may disagree with me. I hope you do. HAVE YOU HEARD ABOUT THE MYNYDD MECHELL UFO CONSPIRACY? CLICK HERE. Anyway, on to Chaos Theory. Drive to the top of the hill from the corner where I nearly drove the Rev. Emlyn Richards into the ditch. I think the good reverand must have been planning his sermon because it was an open road and he didn't see me. 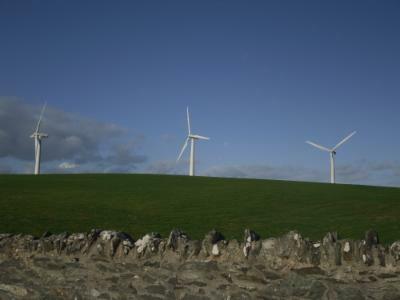 On the top of the hill find a place to park safely and get out of your car to view the nearest gang of turbines; those with Mynydd Bodafon behind them (The picture two up). Do you think that if you stand there long enough that every single turbine will fall into synchronous motion? Just in case you can't do sums, the answer is YES. But the question is WHEN? This is not a question about half a dozen children with a packet of crayons, blindfolds and a bucket of slugs spontaneously generating a Delia Smith Christmas. Or, will conversations in The Crown in Bodedern inevitably turn to dressmaking as the evening progresses? Each turbine is made up of many parts, each individual part so ridiculously minutely different to the other same parts. Each one's gearing is also minutely different to that in another. The forces that separate their motions are ridiculously small in some cases and distinct in others. 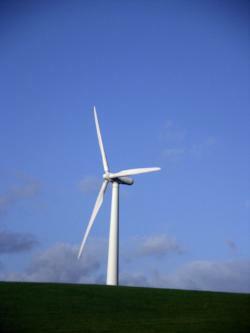 Set the turbines turning at different times and then leave them to spin and generate electricity as is their function. Eventually the compounding periodicity of each micro-difference will bring them all into synchronicity for a micro micro micro second. To the viewer it will seem like an extended period of a few seconds but it's not so. It's the same kind of ridiculously miniscule aberrations from years back that compounded in the City's Economic Prediction Models to absolutely and mathematically guarantee a total collapse of the financial systems. The same Nano-things that will bring all the turbines into sychronous sweeping are the same things that buggered up your pension and holiday plans. It's a direct route now to the village of Llanfechell. Along the way you'll enjoy the lovely character homes on both sides of the road. Interestingly, IF YOU'RE LOOKING TO BUY AN ANGLESEY HOME then keep an eagle eye open because Mynydd Mechell appears to have an above average number of homes for sale. I honestly don't think that there is anything funadmentally wrong with the area. To the contrary, I beieve that individuals have bought up the old houses and private smallholdings as investments to develop and then sell on. Now they're selling on. AND HERE YOU ARE within easy reach of the fabulous Lobster Pot Restaurant in Church Bay, the glorious Cemlyn Bay and the very pretty village of Cemaes Bay. Follow the road through the hamlet - or is it the 'happening that is Mynydd Mechell' - past Ebenezer Chapel (above) and down into the village of Llanfechell. Bodedern is now about eight miles behind you. Like many remote chapels these days the congregation of Ebenezer is very small and diminishing, as is the number of preachers. There are no regular services, mostly just once a month or the occasional Cymanfa. The congregations chase lay-preachers from one chapel to another across a month to maintain the illusion that the chapels are all strong. The passing of these beacons of faith and rural culture from times of poverty is truly sad as we head further into this new cultural and faithless desert. You'll arrive near the square of Llanfechell by the pub Cefn Glas. The garage is further on your right and the Church in the Middle-England square. From this point you can either follow me to the right along the country road toward Rhosgoch or turn left and head back to the western Coastal Road. Arrive in Bodedern from Llangefni (B5109). Drive through Bodedern and take the first right turning 200 metres out of the village. 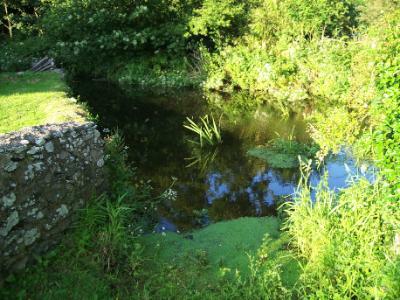 Follow the road to Llanddeusant, where you can turn right for the Water Mill and left for the Llynnon Windmill. Drive straight through Llanddeusant. Left at Bethania Chapel. Follow the road to Mynydd Mechell and thence to Llanfechell. Turn left for the Coastal Road (A5025). Or, Right to take you further into the countryside and Rhosgoch. Continue with the Bodedern-Rhosgoch Drive. Return from Bodedern-Rhosgoch Drive to Anglesey Rural Drives.